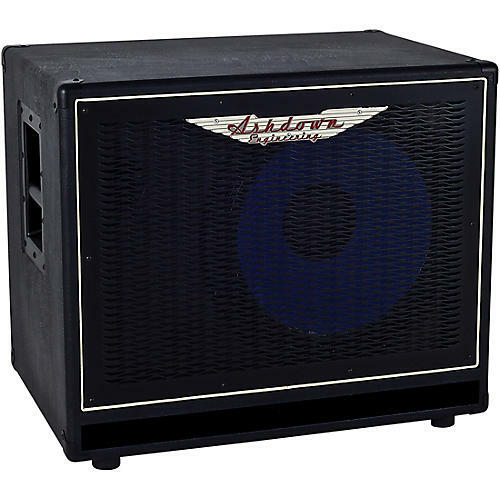 (Open Box) A highly portable 1x15 speaker cab that pumps out plenty of low-end punch. Fill the stage with deep, punchy bass tones with the ABM-115H Compact speaker cabinet. Built to last, the ABM-115H is constructed using high-end birch plywood, rugged covering, metal corners, and a steel grille. A custom-designed 15 in. Blue Line speaker provides a fat, wide-range sound with tons of punch and power. From small venues to large clubs, the ABM-115H bass speaker cab is ready to rock. Ashdown created its own custom speakers for the ABM series cabinets. The ABM-115H houses a 15 in. Blue Line series speaker plus a switchable (Hi, Low or Off) horn tweeter to give complete control over the high end. This speaker delivers the power, transparency, and deep low end you need without giving up the mid attack and high end you need for modern bass tones. No matter what type of gig you have, the ABM-115H is ready for action. Dimensions: 19.68 x 24 x 16.5 in.